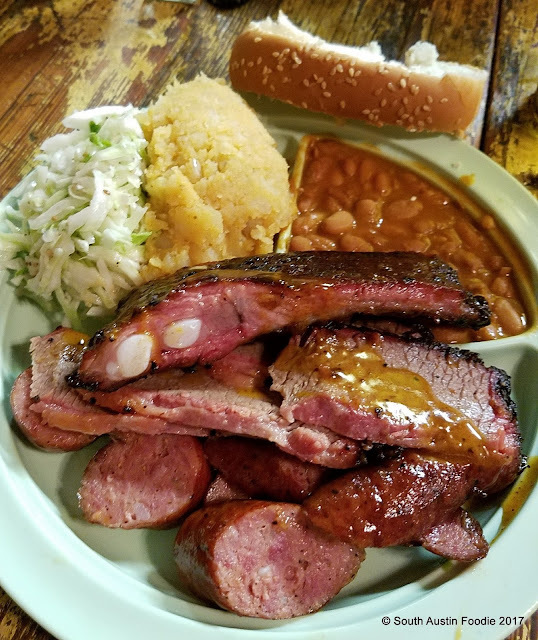 In the past month, I have been to both Salt Lick BBQ in Driftwood (where I hadn't been in years) and Opie's BBQ in Spicewood (where I go a couple times a year). 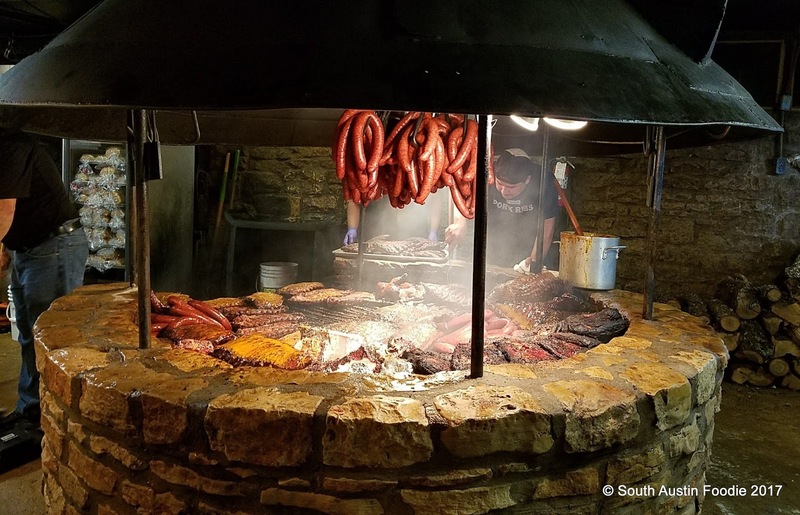 You've probably heard of Salt Lick Barbecue. What started fifty years ago in Driftwood, about 30 minutes southwest of downtown Austin on FM 1826 now has multiple locations and legions of fans. I'll admit, I was not really one of those fans. Until now. I hadn't been to the actual Salt Lick restaurant in probably ten years because it was never my favorite barbecue. 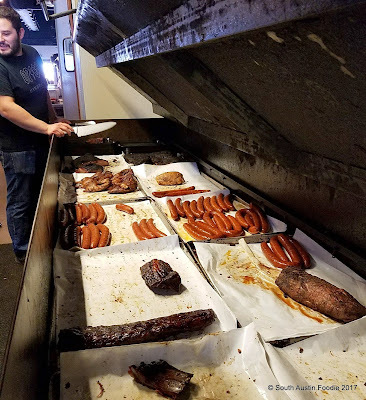 And while I think I'd still pick Opie's as my pick for 'cue AND their sides are killer, I was really extremely pleased by a recent venture out to Salt Lick for a friend's birthday gathering on a Saturday afternoon in early June. I did learn, that if you're a group of ten or more, you can make a reservation and bypass the crowds. And there were crowds waiting, even at 3:30 pm, though I think many were there for the wine tasting room. But we didn't have to wait at all for a table! We were seated in the main building with this amazing meat pit by the entrance. Salt Lick is like a regular restaurant where you order off a menu. I had Thurman's Plate, which comes with brisket, sausage, and a pork rib, along with cole slaw, warm potato salad, and pintos. While I didn't love the sweeter glaze on the ribs, as you can see it's got a nice smoke ring, and it was really tender. All the meats were good and the sides underwhelmed me. Not a lot of flavor to the slaw or potatoes, but it's really about the meats, right? A couple of us talked about how we hadn't been there in ages, and we were all pleasantly surprised. You can buy meats by the pound, but mostly, they sell plates like this. Keep in mind too, Salt Lick is CASH ONLY and BYOB. Many people aren't familiar with Opie's, and I like to think of it as my hidden gem. It's as good as the Lockhart places and even the Driftwood one, and it's the place I always recommend to people seeking barbecue around Austin. 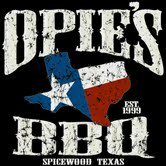 Nothing against Franklin BBQ, but why would I stand in line for a minimum of three hours when I can take a nice drive out Hwy 71 to Opie's, about 45 minutes to the northwest of downtown Austin. While Salt Lick sells mostly prepared plates of food, Opie's meat is all by the pound. When you walk in the main door, you are right by the huge meat vault/locker and there's a board above it listing cuts and prices. They always have the standards, and usually have some more special cuts like pork chops or fancy beef cuts. I stick to the basics, and ever since Artz Ribhouse in Austin closed, Opie's is my go-to place for baby back ribs. You tell the man with the large knife what meats you want and he grabs them for you; if you're eating there, they can slice up everything before wrapping them in butcher paper. Some things are by the pound like the brisket, others like the chicken are sold in half-chicken quantities only. 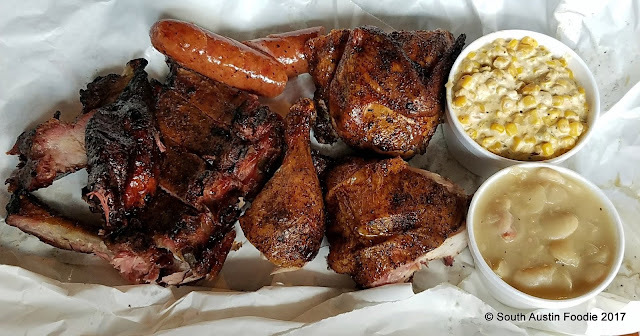 Pictured here is a half rack of baby backs, a sausage link, and smoked chicken, along with spicy corn and the most amazing butter beans you've ever had! (Only available on Fridays and Sundays as far as I know, and they are free, on the condiment bar along with the pintos, pickles, onions, and bread.) This ended up being food for three days for me. One of the things that my friends and I like about Opie's is the quality of the sides, not just the butter beans. The spicy corn has a lot of zip to it; there's tater tot casserole which are shredded potatoes and cheddar cheese. But really, the butter beans are so velvety tender, it's hard not to fall in love. They have great cobblers and brownie bars for dessert too. I digress from the meats though! The baby backs are always tender with a black pepper rub on them. The sausage is a fairly fine grind, has a nice casing on it, and isn't greasy. This is the first time I have had the chicken in a long time, and it's just so moist and flavorful. Would make a great chicken salad. So there you have it folks, lots of meaty goodness. Texas is all about barbecue, and everyone is bound to have their favorites and their opinions, I am no exception. And while barbecue joints are always going to be all about the meats, it never hurts to find a place where the sides are winners too. Grab a friend, take a little drive, and maybe you'll discover your new favorite barbecue spot. The tater tot casserole and banana pudding at Opie's are a must. Ohh, thanks for mentioning the banana pudding! I totally forgot about it because I am not a huge fan, but my friends RAVED about it! I need to go to take a drive for the tot casserole. Also, I wanna take a photo of salt lick's pit!